Put a plan in place (before the chaos of back to school begins) with these smart ideas and products for your home. Don’t just fill these holders with shoes. Fill over-the-door organizers with school supplies, which you can easily hang over a bedroom, office or play room door. 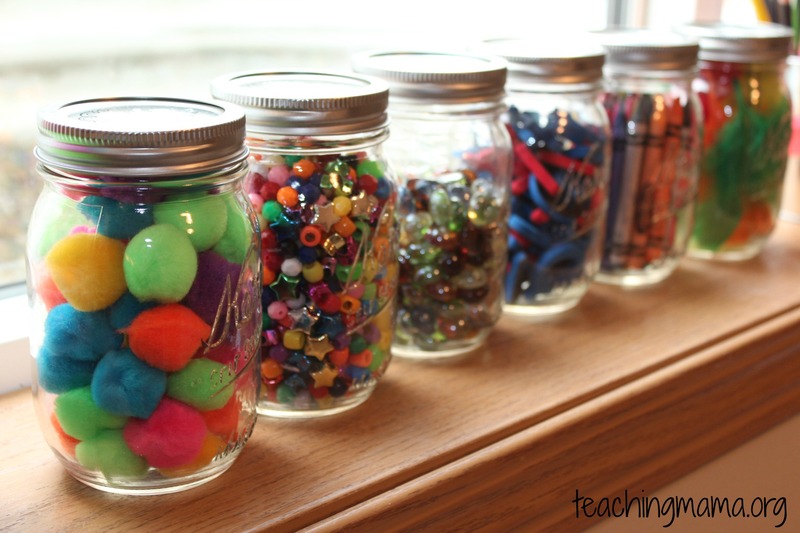 Smaller craft and school supplies might seem difficult to organize, but not if you use glass jars. Buy new glass jars at the grocery store, or wash and reuse pickle, olive, jam or jelly jars. Create your own decorative craft caddy by stacking cake stands together on a lazy Susan. Once filled with school supplies, you can place this caddy in the middle of a table so that multiple children can access what they need. Hang up a peg board to organize your school supplies and make them quick and easy to grab on the go. And to help you keep everything in order, try painting sections of the peg board using different colors of acrylic paint for specific supplies. Fill a K-cup holder with disposable condiment cups. As a result, you’ve created an inexpensive way to hold tiny school supplies, like glitter, beads or sequins. Best of all, you can easily find the materials you need to make this K-cup caddy at any supermarket or discount store. Keep your fabrics organized by using a filing cabinet. Simply wrap fabric around the filing cabinet folders, hang them and voila! This professional-looking holder helps you find the fabric you need without a lot of mess or hassle. You’ll need this school supplies organization hack when your little one is in need of a homemade costume. Move over flatware, because the school supplies are taking over! Reuse any silverware tray as a craft and school supply organizer that easily fits into a drawer or cabinet. Fill small pails with school supplies. And then hang them on wall hooks, a coat rack, on string, a peg board or cabinet knobs. Paint them with acrylic paint to make them more colorful, or leave the pails unpainted for a more rustic look. Wheel your school supplies wherever you need them by organizing them in a kitchen cart. And with multiple levels, you can sort your supplies by type, by class or by color for easy access. Transform an old knife block into a cute crayon holder by drilling holes into the knife slots. You can also attach a few brackets on the sides to hold scissors, glue sticks or pencils. Create a command center or message center for your family. This is a good place to keep mail and bills you can’t tend to right away, store grocery lists and leave important notes. Add a calendar everyone can use and you’ll never miss an appointment or a child’s sports practice again. Get organized by building this handy message center. Hanging baskets for umbrellas and re-useable bags at an eye-level spot ensure that you never be without on a rainy day or grocery day. Plenty of coat hooks allow for everyone to have a spot to hang their seasonal clothing items. A large basket for shoes establishes a no-tripping zone in the mudroom and keeps the clutter at bay. This story originally appeared in Country Woman Magazine. Take that six-pack beverage carrier and turn it into a desktop organizer. You’ll need some duct tape, Mod Podge, a sponge brush and scrapbook paper to decorate. Use it to store pencils, pens, Crayons and markers. A six-pack carrier is also great for the fridge. Next time you empty a store-bought spice container, rinse it out and use it to store small items. Try storing craft supplies such as beads, pins and buttons. Build this sleek, organized entryway storage unit with these plans. We have a strict policy at our house about removing your shoes before entering the house. (It works most of the time.) Once we implemented the rule, the next problem was the clutter of shoes blocking the door. While I was looking at the coat rack in the entry, it dawned on me that I could do the same for shoes, so I built another one and hung it close to the floor. — Jimmy Keen. Get your mudroom organized with these 15 simple solutions. If there’s one thing a teen bedroom needs, it’s space to hang out. Simple shelves divide this room into sleeping and living space while maintaining a light and airy look. These 12 fresh ideas won’t have your teen complaining about a boring room. There will be less complaining about homework with an organized home office space for your teen. The dark wall color draws you in and the white wall decor, chair and desk, along with some well-placed pops of color, make this the perfect environment for studying. A hanging mesh storage hammock creates a cradle for lightweight toys like balls or h toys. Or, use a cloth hammock or colorful sheet to create the same effect. A yard or two of tulle fabric works great and has a fairyland look. And when you’re done with your kid’s room, it’s likely time to apply some handy storage ideas to your garage. Organize your small office supplies in this great-looking holder. Here’s a perfect way to organize all those paper clips, rubber bands and pushpins. All it takes is a magnetic knife/tool holder strip, small jars with lids and a few fender washers. Check out the complete plans for a magnetic office supplies holder. It’s easy to find stuff stored in jars. Screw hose clamps to a board and mount it on the wall in your home office. Secure mason jars in the hose clamps to create clever storage for office supplies such as stamps, paper clips and string. The clear jars let you immediately see where everything is. This is also a great idea for bathrooms and workshops. Check out a really clever cleaning hack you can do with a mason jar. Think of your stairwell as an extension of your basement. If there’s room, add a couple floating shelves and hooks for a little extra storage. A chore chart can become a good visual way to get kids to do their chores. They’ll be some satisfaction when they get to move the task to the completed column. Check out 12 other painless ways to get kids to do chores. Stop scrambling for a homework assignment as you’re about to head out in the morning. Keep everything organized by subject with a homework organizer. It’ll help establish good organizational habits. Pick up an outfit organizer like this so you can save yourself a lively discussion before school. These tips can help transform a crowded closet. Does your kid keep growing or do multiple children share a closet? Separate hanging clothing by size just like they do in the stores with closet rod dividers that you can label. Slip an accessory pocket over the back of a closet door to match socks, underwear, barrettes, hats and more ahead of time. You can purchase accessory pockets at Amazon. Keep pairs of socks with their mate, pajama sets or matched outfits together by using a small sock clip after laundry. This will help pairs stick together, even if they’re discarded on the ground. When winter comes, you’ll want to have one of these fun mitten drying racks around to keep them in pairs.